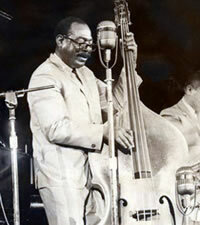 Local jazz bass player Milt Abel died February 3, 2006, at age 77. He and his first wife, Bettye Miller, performed for many years at the Horseshoe Lounge on Troost Avenue near East Linwood Boulevard. She died in 1977 and he is survived by his second wife Linda Abel whom he married in 1980. Milt and Bettye toured nationally and played at the Newport Jazz Festival in the 1960s. “In May he was one of seven local musicians awarded Lifetime Achievement in Jazz awards during a concert to benefit the Coda Jazz Fund.” A traditional jazz wake and jam session in his honor was held February 9, 2006 at the Watkins Bros. Memorial Chapel and his funeral was held February 10, 2006 at St. Andrew’s Episcopal Church. Bassist Milt Able,and his wife pianist Bettye Miller, were among the premier Kansas City jazz artists performing in the 50’s 60’s & 70’s. Known for their musical polish and sophistication, Bettye and Milt brought a unique warmth and intimacy to their performances. Miller was often spoken of as the “queen of Kansas City jazz” – the first since the great Mary Lou Williams – and she and husband Milt Abel carried on Kansas City’s celebrated musical tradition for twenty-five years. It was while playing at the Horseshoe Lounge on 32nd and Troost, that she met Milt Able. They performed together at the Horseshoe Lounge for ten years, followed by regular engagements at various Kansas City jazz clubs, including the Plaza III, Putsch’s Strawberry Patch, and Mr. Putsch’s on the Plaza. They also performed occasionally in Chicago, New York, and Las Vegas, as well as at numerous jazz festivals and in benefit concerts. Miller’s death at the age of 49 was considered a major loss to the local jazz scene. A handsome man partial to staid sports jackets and slacks, Abel was infused with a quiet dignity. He was an Episcopalian, after all. While his talent was comparable to better known jazz bassists Milt Hinton and Ray Brown, Abel never achieved national acclaim. Abel had a fine singing voice that matched his smooth tone on bass. In a 1998 issue of JAM magazine, Mike Metheny mentioned that Abel sung at Charlie Parker’s funeral.